All the establishments listed below offer secure online booking services. Click on the headings below to view their availability calendars and to book (you will need to have your credit card details to hand). You can book using your credit card or, if you have a PayPal account you can use that also. Once you have complete your booking you will receive a confirmatory email from PayPal and also from Quinsolve - RoomsOK.com (this service). 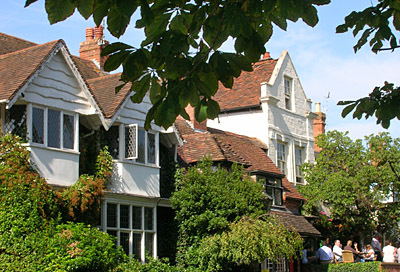 You will find a variety of establishments: Bed & Breakfast (guesthouses), Hotels, Inns and Farmhouses - all in and around Stratford-upon-Avon. Welcome to Springfield House, set in ten acres of glorious Warwickshire countryside, just one mile outside Shakespeare's Stratford-upon-Avon. We are proud to offer the finest, family-run bed and breakfast accommodation in our beautiful Georgian country house. We have taken great care to furnish and decorate our three spacious guestrooms to the highest standards. Each room has been recently refurbished, including the en-suite facilities. We provide a homely and relaxed atmosphere and our aim is to make your stay as comfortable as possible. Elegant Victorian town house, charmingly refurbished offering luxurious accomodation in the heart of Stratford's Old Town. We look forward to welcoming you to Broadlands. Somewhere special  once owned for almost a quarter of a century by the governors of the Royal Shakespeare Company, a pied a terre for actors, this beautifully refurbished Victorian Villa built in 1897 now provides nostalgic accommodation for the discerning. Situated in the centre if Stratford-Upon-Avon, ideally placed for your visit. An attractive Victorian 1837 building, originally built as a Spa. Queen Victoria graciously gave her name to the hotel, and her coat-of-arms is built into the gables. with beautiful antique furniture, a few minutes from Stratford. We have twin, double and family rooms that can accommodate 4 and 5 persons. Sequoia House is a spacious Victorian town house of charm and character offering our guests space and luxury with immaculate housekeeping, fine kings sized beds of character, crisp linens and super fluffy towels. Spacious double bedrooms with individual furnishings and decor are styled in Sanderson and Zoffany wallpapers and fabrics. Fully tiled bathrooms are stocked with bath robes and luxury toiletries. Breakfast is a relaxed affair and the menu includes seasonal fresh fruits, compotes & yoghurt, cereals & mueslis, homemade preserves and choice of AGA cooked English breakfasts. A warm and welcoming attractively decorated guest house just a short walk from Stratford upon Avon town centre, the railway station and racecourse. Stratford is within easy reach of historic Warwick and the beautiful Cotswolds and many other places of interest such as Blenheim Palace, Oxford, Coventry, Birmingham  the NEC and airport are only 30 minutes away. Newly Opened and immaculately presented throughout. The Waters Edge Guest House is a this stylish, exceptionally well appointed guest house offers something different to those visiting Stratford-upon-Avon and the local surroundings. Set in one and a half acres of grounds with riverside frontage, this boutique guest house sits in a truly scenic environment. Whether its relaxing by the waters edge or taking in the tranquility of the surroundings and the grounds, your stay at the Waters Edge Guest House in Stratford-upon-Avon will be truly memorable. Well known for its superb home-cooked food, all freshly prepared to order, ideally placed for the Cotswolds, Stratford and Warwick. Sequoia Mews Apartment is perfectly located within a private mews, fully equipped newly built apartment, sleeps 4 (2 double bedrooms), near the River Avon,just a short and picturesque stroll along the Tramway Walk to Stratford's shops , restaurants and World Class Theatres.